In times when so many young cooks are entering the culinary world, in a world that the culinary theme has developed in meteoric fashion in the last ten years, but not always in an orderly fashion. Thus, in the short time that I have, I try to make a little order, especially with regards to concepts that we tend to use on a daily basis. A lot of the time, names, concepts, and methods are taken out of context, and I’m dedicating today to a few words on—aioli. It occurred to me many times that many cooks treat aioli like mayonnaise, and, in point of fact, aioli has turned into another name for mayonnaise . Correct, there are similarities between the two. First of all, both are emulsions, and in this case they are “cold emulsions” (an emulsion is a mixture of fluid and fat combined into an homogenous texture by external force such as whipping ). 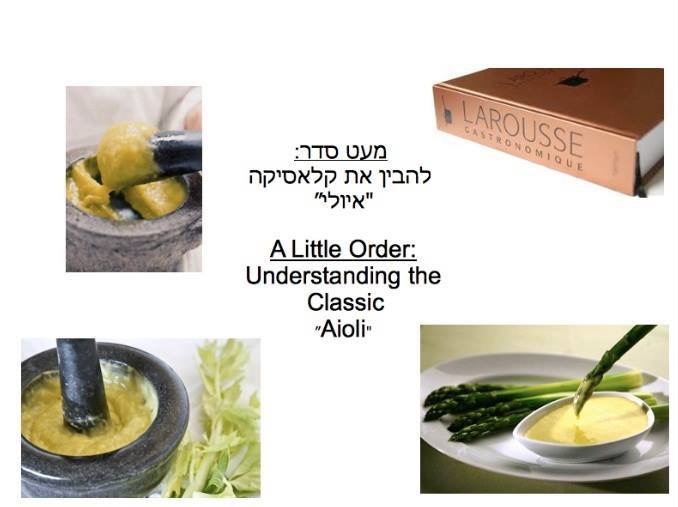 Classic aioli (generally, when I refer to the concept of “classic,” I mean how the concept appears in Encyclopedia Larousse, or something similarly important) comes originally from the name ailoli, composed from two words combined together—ail (garlic) and oli (oil), which is a classic Provencal sauce. At the end of this post, you will find a link to a clip that describes the preparation of classic aioli using a mortar and pestle. The ingredients are garlic, yolk, salt, and oil; it is important to note that yolk does not appear in classic aioli recipes, but many add it in order to make the work easier. There is no end to variations upon aioli, but I thought it was important here to make a little order in our kitchen so that you would understand the basics—from here you can fly wherever you would like. שמי מיכאל כץ טבח במקצועי מאז 1991-לא מעט תפקידים עברתי בחיי בינהם מורה בבית הספר ״ קורדון בלו ״ באנגליה שם גיליתי כמה אני אוהב ללמד ולכוון את הדור הצעיר. This entry was posted in cooking, kitchen, kitchen techniques, sauces, Uncategorized and tagged Aioli, aioli sauce, chef, cooking, cooking schools, cooking techniques, cooking tips, cooking training, kitchen techniques, learning to cook, mayonnaise, mayonnaise sauce, sauce, sauces, tarining. Bookmark the permalink. Tip/Guidance for the Young Chef: Mixing Salad Leaves for Service.